Termites can cause severe structural damage. Flowers are beginning to bloom and warmer weather is upon us, two sure signs of spring. May also marks the worst month for termites in New England and pest experts are reminding residents living in Southern New Hampshire and Massachusetts, where termites are prevalent, to be aware of their potential harm. “Termites can cause huge damage and they are probably the worst pests when it comes to structural damage,” said Ron Keeler, one of Modern® Pest Services’ General Managers. “In New England we deal with Eastern subterranean termites that never sleep and are relentless. In my thirty-eight years in this business I have seen substructures of homes so compromised by termite damage that they have had to be replaced costing homeowners tens of thousands of dollars.” According to the National Pest Management Association (NPMA), subterranean termites cost American homeowners an estimated $5 billion annually and unfortunately, termite damage is rarely covered by homeowner’s insurance. Termites live in large colonies where they continuously produce what are referred to as workers, soldiers, and reproductives. The winged reproductives (i.e. swarmers) have a pair of wings that break off after swarming. An average termite colony consists of 60,000 to over a million termites and most are white or light colored, although the swarmers that homeowners usually see are dark brown to black. 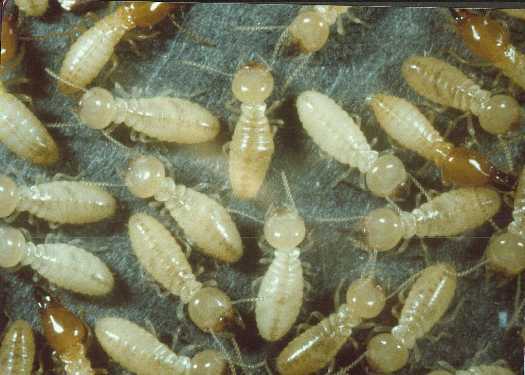 If termites are found, they can be very difficult to treat because they reproduce so rapidly. Because termites are sensitive to both light and air, they live underground in soil making them very difficult to notice. They feed on all types of wood, preferring wet, rotted or moldy wood, and are able to digest the cellulose found in the wooden structures that make up our homes. Workers build mud tubes that attach to the foundation of a building and then they work their way up to the wooden structure to begin feeding. Mud tubes mark the connection from a termite colony to their food source. Termites thrive in moist, warm conditions, so springtime is when they become most harmful to our homes. Each fall the colonies move down in the soil to seek warmth. However, termites can be active year round in heated structures. Swarmers – Swarming termites occur seasonally, often in the morning after a warm rain and are an obvious sign that a well-established colony is in the house or nearby. Wood damage—Sagging floors and doors and windows that don’t open or shut easily may indicate wood damage by termites. Mud tubes/dirt piles – Mud tubes near the base of a wood structure or dirt accumulation from mud tubes usually indicate a termite infestation. Cracks in the wood near these dirt piles can also be a sign of termites. Modern® Pest Services has recently teamed up with Dow AgroSciences to offer consumers the Sentricon® Termite Colony Elimination System with Always Active™ technology. This revolutionary bait system, which is now part of Modern’s HomeCare Termite Protection Program, involves placing bait stations into the ground around the perimeter of a home during the initial installation and then our service professionals check the stations twice a year. Termites discover the bait inside the station, feed on it and then deliver its slow-acting chemistry to the colony. The active ingredient in the bait, noviflumuron, disrupts termite molting, which then eliminates the entire colony. Interestingly, studies have shown that termites prefer this bait over wood. Adding to its appeal for consumers, the Sentricon System used by Modern was the first product registered by the U.S. Environmental Protection Agency under its Reduced Risk Pesticide Initiative and was the recipient of the Presidential Green Chemistry Challenge Award. If termites are suspected, a pest management professional (PMP) should be contacted for a thorough inspection to determine the extent of the infestation and then a treatment strategy and follow up plan should be discussed. 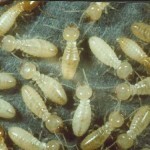 For more information regarding termites, please visit www.modernpest.com or contact us at 1-888-997-3312.